My friend Nick first told me about Crazy Cat Bakers. Frankly, the man was mildly obsessed. It seems that every time I saw him, he would ask if I had tried Crazy Cat yet. Not wanting to lie to him, I’d say it was on my “to do” list and I’d get there as soon as I could. Well, that line could only work for so long. So, I tried it once and was pleasantly surprised, but it was quickly pushed to the back of my mind. Fast forwarding a few months, during one of my daily deliberations about where I should go for lunch, Crazy Cat popped up. I figured I should give this little bakery another chance so what follows are the results of two visits to the Crazy Cat Bakers. To start, you really need to know where you’re going. Crazy Cat is nestled in the corner of Highland Village. If Nick hadn’t told me where to look, I probably would have given up and gone somewhere else for lunch. Inside the small venue, there is plenty of cat related kitsch, all very amusing. However, once you walk in you can’t help but notice the small but enticing selection of desserts they have on the counter, but that would come later. As interesting and healthy as salads are, I was interested in something a little more substantial, namely the Meatloaf Panini. This panini looks quite appealing. There's a substantial wheat loaf and a good bit of meatloaf, peppers, and cheese peeking out from the sides. Biting through the crusty loaf, there was an onslaught of sweet peppers and caramelized onions, but the flavor of the meat was strangely absent. Actually this wasn't really a cohesive loaf, instead the meat was past the point of juicy and more like a soupy, sweet mound of meat. Looking past the initially promising Meatloaf Panini, I decided to try the Highland Club next. Consisting of turkey, bacon, brie, romaine, tomatoes, sautéed onions, and basil pesto mayonnaise on sourdough bread, it certainly had the components for a high quality club. With the creaminess from the mayo and the sweetness from the onions, the arugula provided a nice touch of bitterness. Actually this was a satisfying, very creamy, and sweet sandwich, but I prefer a meatier and more savory club. Before moving on to the sweets of Crazy Cat Bakers, I'll finish with the savory; that means moving on to my second visit. 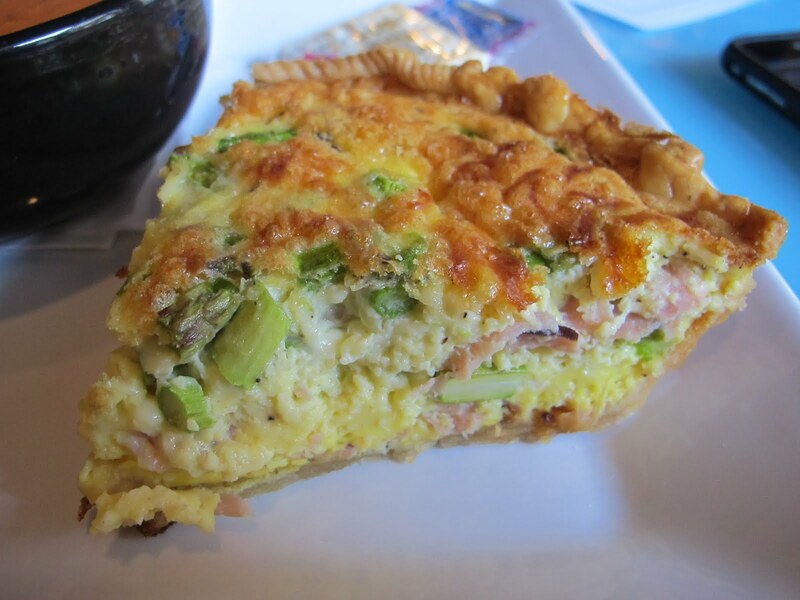 As before, there was the constant lure of dessert when ordering, but I stayed my sweet tooth and focused on the special of the day, the quiche. There aren't many sources of quiches in the Jackson area, so I had high hopes for this Ham & Asparagus quiche. 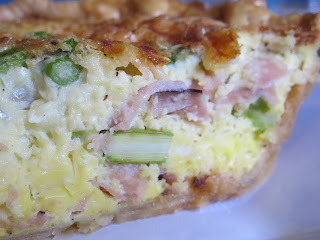 Overflowing with ham and crisp asparagus, this quiche ticked all the right boxes. A nice feature of this quiche was the crust. With the perfect level of flakiness, it was an excellent foil to the filling. Served just warm with a moist, eggy filling, the ham was a little subdued but with a touch of salt and pepper, this was a simply delicious lunch. Even though the quiche was good enough to stand on its own, I reasoned that a side of soup couldn't hurt. 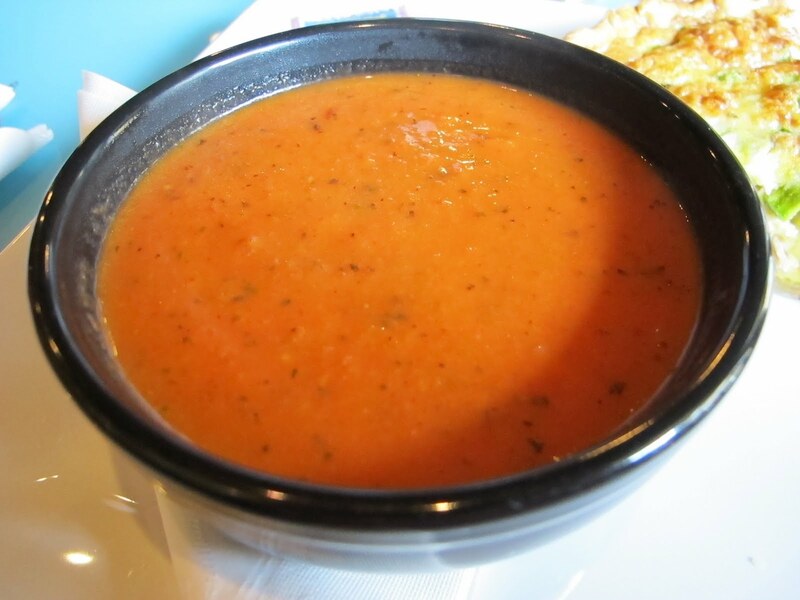 This was a smooth puree of tomato and basil. It was simple, hot, and extremely satisfying. 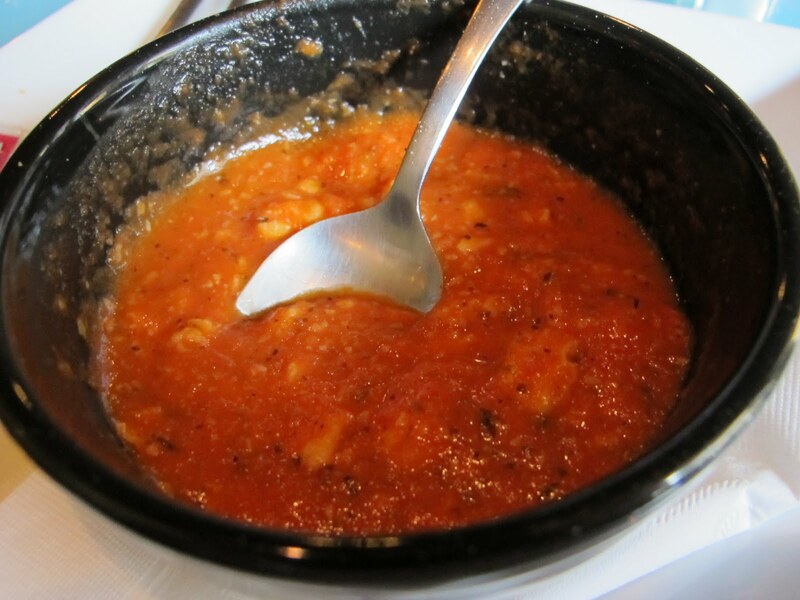 If there was one complaint about this soup, it was a little watery; a simple problem that was remedied by a few crackers. 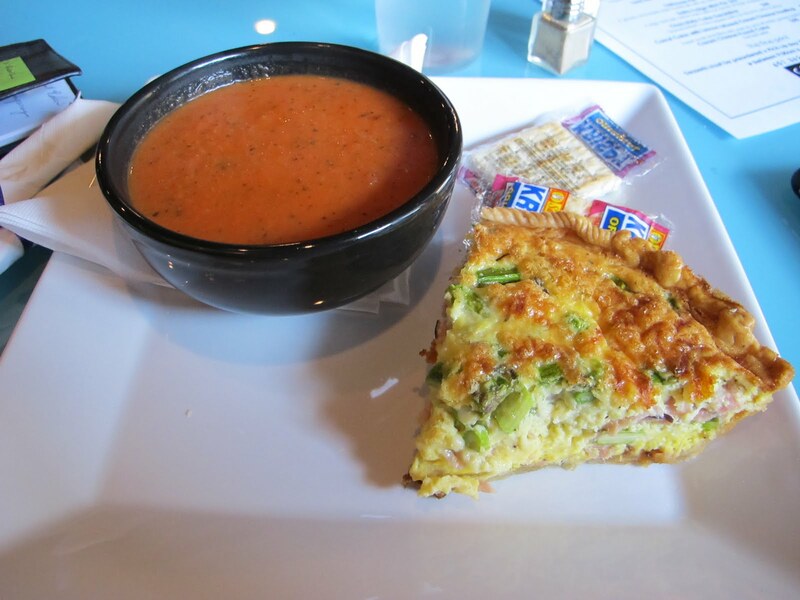 Regardless of the thickness of the soup, the combination of this soup and quiche was excellent. With the savory portions of both visits covered, it's time to move on to the sweet; a segment where Crazy Cat excels. Of course there's only so much you can try at a time. So during my first trip to Crazy Cat, I thought the Espresso Brownie was an excellent place to start. Much as you'd expect, this was an excellent dessert. On the bottom was a dense, incredibly rich chocolate brownie. The frosting on top was more akin to a cafe au lait than the full flavor of espresso, but a minor quibble. This was an excellent brownie and entirely too rich to finish in one sitting. 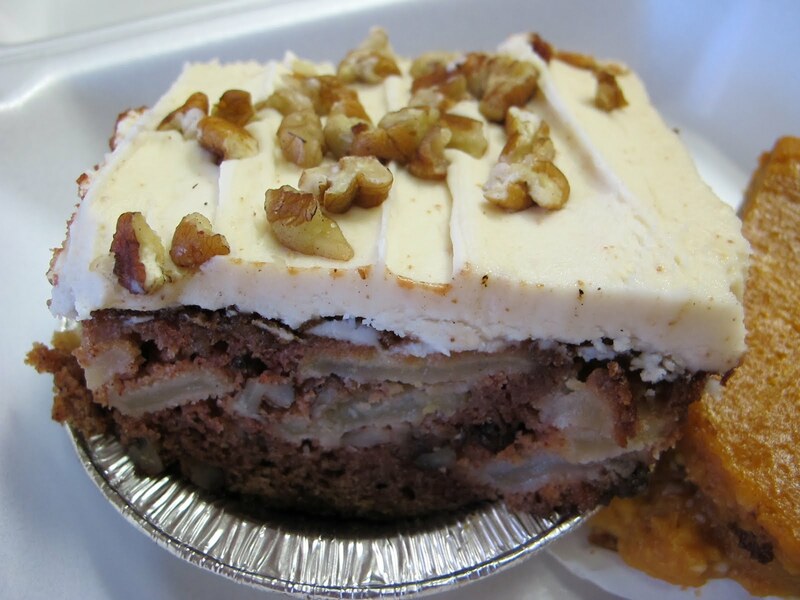 On the second visit to Crazy Cat, I felt like I needed to try more of what Crazy Cat had to offer, starting with the bread pudding. 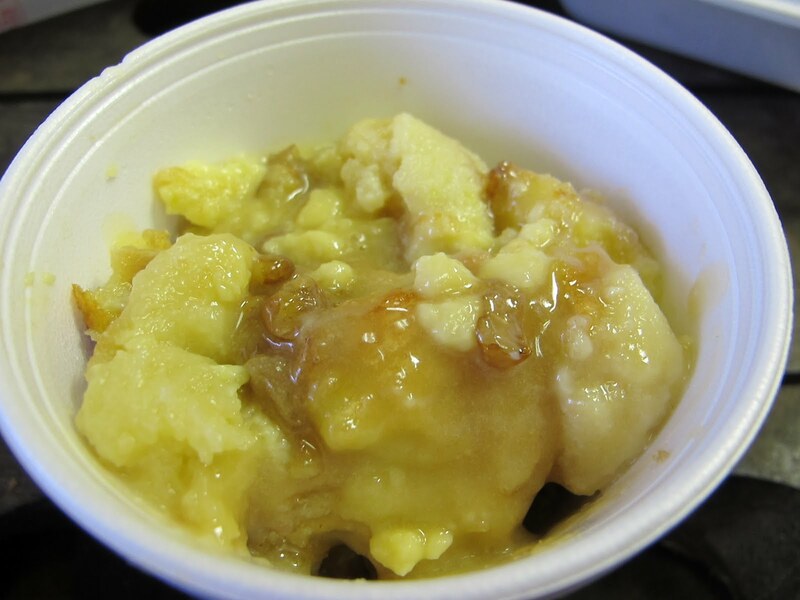 Covered with a brandy butter sauce, this was as rich and sugary as you expect a bread pudding to be. I just wish there was some variety in texture. 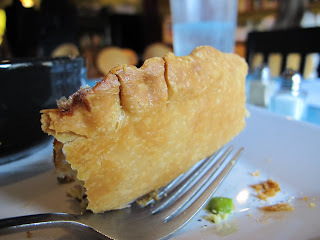 Each bite was a mushy sweetness; I was begging to come across the occasional chunk of pecan or crunchy sugar from the crust. This was a good bread pudding, but I prefer a bourbon flavor to the brandy. Sometimes the name says it all, especially with the Pumpkin Ooey Gooey Butter Cake. 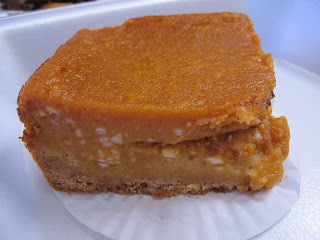 The texture certainly lives up to its name and each bite was full of cinnamon and pumpkin. 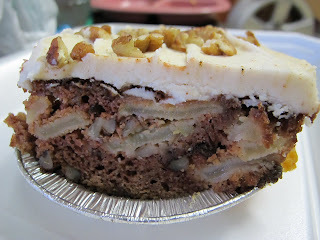 Last was the Apple Cake with Brown Butter Frosting. You would think the brown butter frosting would dominate this cake. But with layer upon layer of apples, this was a superb dessert. I suppose it's a sort of mixed bag with Crazy Cat Bakers. While the desserts alone are worth repeat visits, the savory was not as consistent. Even though the sandwiches were visually appealing, the meatloaf was had an unappealing texture and was too sweet. On the other hand, the quiche and tomato soup were hard to beat. I never have been completely blown away by the savory offerings at Crazy Cat Bakers. That being said, there are far too many positive aspects to discount this hidden eatery. Even if you're like me and have had mixed results with their savory offerings, Crazy Cat Bakers deserves to join your lunch rotation even if you just need to satisfy your sweet tooth.